A double-blind placebo-controlled cross-over trial was undertaken to evaluate the effect of antioxidant supplementation on maximal oxygen uptake during bicycling, 31-phosphorus nuclear magnetic response spectroscopy (31P-NMRS) detected muscle energy metabolism during plantar flexion and muscle fatigue evaluated by 1-s electrical stimulation at low (10 Hz) and high (50 Hz) frequency. Seven male triathletes received daily oral antioxidant supplementation in capsule form including 100 mg coenzyme Q10 (CoQ10), 600 mg ascorbic acid and 270 mg α-tocopherol or placebo over a 6-week interval. Serum concentration of CoQ10 was significantly higher in the antioxidant phase (1.80 ± 1 μg · ml-1, mean ± SD) than control (0.9 ± 0.2 μg · ml-1) or placebo phase (0.9 ± 0.3ug · ml-1) (P< 0.01). 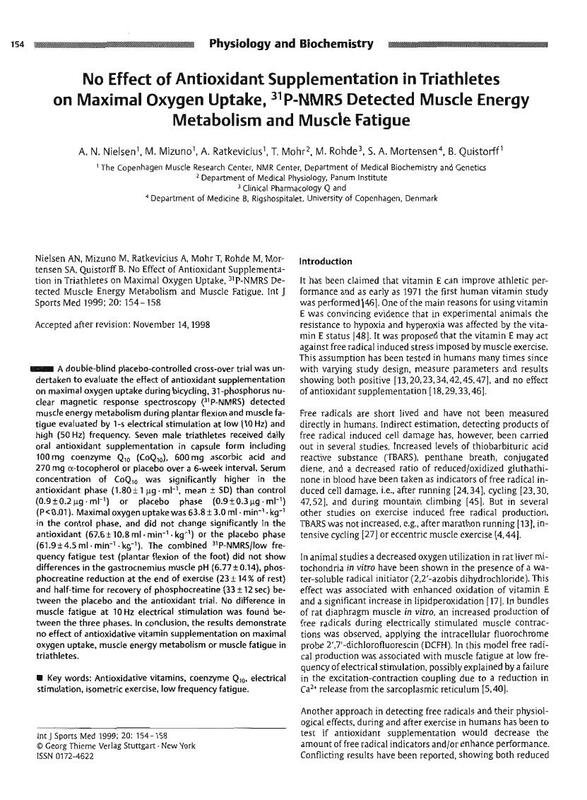 Maximal oxygen uptake was 63.8 ± 3.0 ml · min-1 · kg-1 in the control phase, and did not change significantly in the antioxidant (67.6 ± 10.8 ml · min-1 · kg-1) or the placebo phase (61.9 ± 4.5 ml · min-1 kg-1). The combined 31P-NMRS/low frequency fatigue test (plantar flexion of the foot) did not show differences in the gastrocnemius muscle pH (6.77 ± 0.14), phos-phocreatine reduction at the end of exercise (23 ± 14 % of rest) and half-time for recovery of phosphocreatine (33 ± 12 sec) between the placebo and the antioxidant trial. No difference in muscle fatigue at 10 Hz electrical stimulation was found between the three phases. In conclusion, the results demonstrate no effect of antioxidative vitamin supplementation on maximal oxygen uptake, muscle energy metabolism or muscle fatigue in triathletes.